Last week, I attended an early screening of the prologue for the 'The Dark Knight Rises' at the BFI IMAX, which had as much security as an airport. My phone was confiscated, put into a little plastic envelope and sealed. My bag was searched and I had to join a long queue to be scanned with a metal detector. Clearly, they didn’t want people to record the prologue and spread it on the Internet. It was all a bit pointless, because the footage got out anyway. You can find it in blurry mobile-vision on Google, or you can pay to see it played with 'Mission: Impossible 4' at certain IMAX cinemas. A CIA officer takes custody of a certain Dr. Pavel and some hooded prisoners supposedly working for “the masked man”, and loads them onto his plane. Once airborne, the officer interrogates the prisoners for information on Bane, only to discover that one of them is Bane himself. He calmly announces that he intends to crash the plane. What follows is an elaborate mid-air hijack where Bane’s own aircraft drags the CIA plane, vertically, through the sky. Bane’s men board the smaller aircraft to kidnap Dr. Pavel, but not before transfusing his blood to an unconscious man in order to fake his death. One of Bane’s men sacrifices himself by staying behind, because “they expect one of us in the wreckage”. As the CIA plane is dropped, Bane and Dr. Pavel are hauled to safety by a cable, reminiscent of the Skyhook in the Hong Kong segment of 'The Dark Knight'. The sizzle reel at the end of the prologue featured a shot of Bane tossing aside Batman’s shattered cowl. The trailer shows Bane telling an unmasked Bruce “when Gotham is ashes, you have my permission to die”. In comic book lore, Bane is famous for breaking Batman’s back. Surely that’s too much, even for Christopher Nolan? Maybe not - Bruce Wayne has a cane in the trailer, so at some point he definitely gets seriously injured. Whether Bane actually breaks Batman’s back remains to be seen, but there must be a good reason for the confirmed 8-year gap TDK and TDKR. It is unlikely that Batman simply took a holiday. In the new trailer, Bane talks about turning Gotham to ashes. That’s pretty much what Ra’s Al Ghul tried and failed to do in 'Batman Begins', so it makes sense that the League of Shadows would try again. It has been confirmed that there will be scenes of Ra’s Al Ghul in his youth, and that Liam Neeson will return in a cameo appearance. The fact that Bane is able to tell one of his men to sacrifice himself for their cause suggests that the men under his control are no ordinary mercenaries for hire. At this stage of the Batman tale it seems a little too late to introduce a new deadly cult of the same calibre. It is safe to assume that Bane works for the League of Shadows, but to what capacity? Is Bane running the League of Shadows, or is he working for someone else? This prologue has definitely piqued my curiosity. As much as it has revealed, it leaves some burning questions that only time (and a tantalising drip feed of hints) will answer. I’m starting to feel the hype. 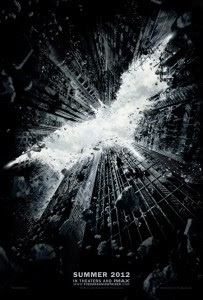 'The Dark Knight Rises' is schedule for release in July 2012.